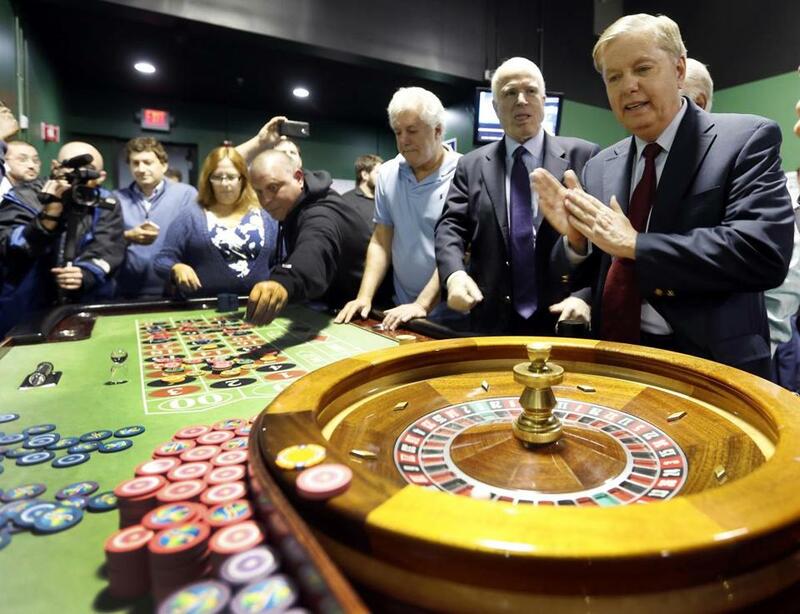 Senator Lindsey Graham, right, rubbed his hands for luck while playing the roulette wheel at a charitable gaming poker room during a campaign stop in Manchester on Friday. Senator John McCain was to his right. SALEM, N.H. — Campaigning with US Senator John McCain, Republican presidential candidate Lindsey Graham expressed frustration Friday with his party and presented himself as a pragmatic option for GOP primary voters. The senator from South Carolina, speaking at the American Legion Hall to about 45 people, said as president he would follow the model of give-and-take practiced by President Reagan, a Republican, and former Speaker of the US House Tip O’Neill, a Democrat. Graham said the pair cooperated to save Social Security. He said he’d be open to the same kind of bipartisanship to strengthen the program today. “If we keep yelling at each other, we’re all going down the drain together,” he said of the discord in Washington, D.C.
Graham, whose campaign has struggled to draw the support of even 1 percent of Republican voters in polls, repeatedly handed his microphone off to McCain throughout the event. The senator from Arizona handily won the New Hampshire Republican primary in 2008, when he ultimately won the Republican nomination but lost the presidential race. On this, McCain’s third visit to the state in support of Graham, he urged voters to consider his good friend for the presidency. McCain is scheduled to campaign with Graham, who is in New Hampshire on a 9-day swing, through the weekend. Robert Troy, a mechanic from Raymond, N.H., who attended the event, said he didn’t know much about Graham. He said he believed he could be a good candidate but needed more exposure to mount a credible campaign. Rosalia Fodera can be reached at rosaliajfodera@gmail.com. Andrew Lemos can be reached at andrew_lemos@emerson.edu.